Mike McCready, guitarist and founding member of the American rock band, Pearl Jam, recently donated his time to create a radio public service announcement (PSA) series on behalf of the Crohn's & Colitis Foundation to raise critical awareness for Crohn's disease and ulcerative colitis. Mike McCready of Pearl Jam is one of the many celebrities with IBD who help out with promoting awareness and fund raising. This year he has made a series of radio public service announcements. Thanks, Mike. Rock on! I've talked about hobbies and work, and how they are a great distraction from pain. I saw a post out there on the Internet asking what people's hobbies are. There were so many different examples of hobbies, I thought I would make a list of hobbies I already have, hobbies I would like to do, and hobbies I am not sure I want to try, but are cool. Please comment - What hobbies and activities do you do? What would you like to try if you had the time and energy? I am not sure who made this meme image up lolastrasz on Reddit.com/crohnsdisease made this. (look up Scumbag Steve Meme on knowyourmeme.com for more funny pics with the hip hop hat wearing guy) This is pretty funny. 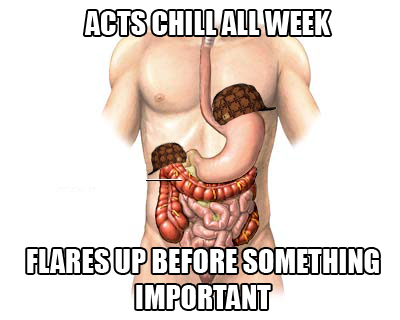 Yup, scumbag Crohn's - Acts Chill All Week, Flares up before Something Important. How cool is this? 5 people who needed a kidney but didn't have a family member or loved one with a match all got together and with the help of a computer program were able to make it all work out. Someone with a kidney to donate was matched with someone needing a kidney, and their donor gave a kidney to the first donor's person. Just like a major 5 team sports player swap, but with organs. :-) Wow - computers are handy to have around, aren't they? April is Crohn’s Disease Awareness Month. You can now text CCFA to 90999 to donate $5.00 to the Crohn's & Colitis Foundation of America. I suggest everybody reading this post this to their Twitter, Facebook, email your friends, blog it, whatever. It's our month people! Ashley Hasty was diagnosed with Crohn’s disease about a year ago. Since she is a Textile and Apparel Management Phd student, and fashion blogger on www.ahastylife.com, she has decided to use her situation to bring awareness about Crohn's and raise money for the CCFA. April is Crohn’s Disease Awareness Month. Ashley Hasty will wear the same purple dress each day this month to raise money and awareness for Crohn's. It may not be the world's most glamorous disease, but it's not like we got to pick it! At least the dress is gorgeous.